A Land Cruiser for serious collectors. 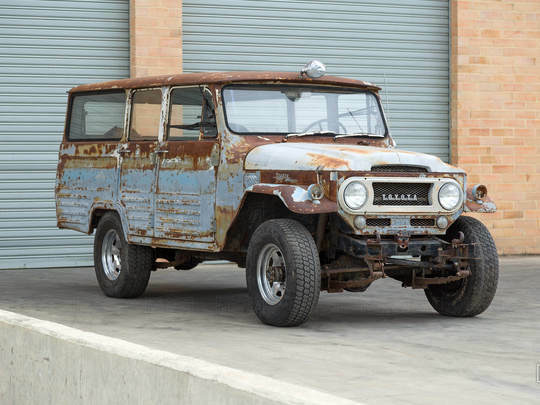 It’s been nearly 50 years since an FJ45LV rolled off a Toyota production line, but that has only made it more desirable in the eyes of collectors. That, coupled with a short production run and limited numbers, make it one of the rarest of all classic Land Cruisers. Production for the FJ45LV began in 1963 and lasted until 1967, when it was replaced by the FJ55. During that time, roughly 5,080 were produced — and only about a thousand made it to the United States. How do you know if this is the real deal? Just look at that massive rear overhang and those corrugated side panels — all hallmarks of the FJ45LV’s unique body. The credit for this look goes to Gifu Body Co. Ltd., a coachbuilder that was once associated with Toyota. First registered in August of 1967, the FJ45LV you see here is a two-owner truck that spent most of its days near Tucson, Arizona. While this FJ45LV does have some rust and wear, it is a still a prime restoration candidate. The chassis and drivetrain are solid, showing surface rust only, and the interior is rough, but complete. While the right door pan does show considerable rust, there is only minor rust on the left front door pan. All body parts (doors, handles, latches, locks, etc.) are intact and functioning; all gauges, lights, horns are in working order; and best of all, this FJ45LV still runs and drives! See the same potential here that we do? Let’s do a project together! Find out more about our restoration process here, or get in touch with us below. Serious inquires only.